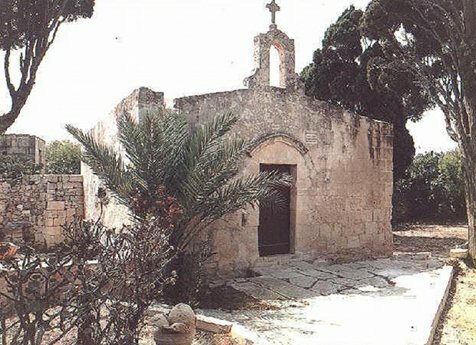 In the Middle Ages, Hal-Millieri was a tiny farming community in the country-side between Qrendi and Zurrieq. The inhabitants tilled the fields in that area, and at around the year 1420 they built their own modest church of the Annunciation. In the late 17th century, the village was abandoned by its inhabitants and the Annunciation Chapel was left desolate among the fields. After centuries of neglect, the little chapel wits rediscovered, and in the 1960's it was taken over by Din I-Art Helwa - the National Trust. Restoration work was taken in hand on a voluntary basis, and within a few months the chapel was restored to its former state. The Chapel consists of a nave formed by transversal pointed arches which support a roof made of flat stone-slabs. The facade is of plain ashlar: but the doorway is topped with the typical mediaeval hood-mould. A small churchyard in front of the chapel served as burial ground for the community. During the clearance operations, 15th century frescoes were discovered on the wall spaces between the arches of the nave. These show a series of saints, painted in the Sicilian style. Although not of great artistic worth, the paintings throw valuable light on life and conditions in Malta during the Middle Ages. Nowadays, the chapel and its precincts are maintained by the Trust. The chapel is cherished as a rare specimen which throws light on building techniques in Mediaeval times. Chapel precincts and interior may be visited by special arrangement.